John Kasich shows momentum in N.H.
Ohio Governor John Kasich campaigned in Derry, N.H., on Wednesday. PETERBOROUGH, N.H. — Senator Lindsey Graham has attended 43 events in New Hampshire this year. Governor Chris Christie of New Jersey comes to the state almost every week. Businesswoman Carly Fiorina spends five-day stretches in New Hampshire, and former New York governor George Pataki seemingly doesn’t campaign anywhere else. But despite all their strategic efforts, another candidate has captured the early primary momentum in New Hampshire: Governor John Kasich of Ohio. Less than a month after announcing his late start in the presidential race, Kasich has surged in New Hampshire surveys to third place in the Republican presidential primary, behind New York businessman Donald Trump and former Florida governor Jeb Bush. He’s picked up top-flight endorsements, including one of the state’s best-known party strategists, the state House majority leader, and a county sheriff. After a standout performance in last week’s presidential debate, Kasich saw crowds swell at his town hall meetings on Tuesday and Wednesday in the state. New Hampshire Republican strategists said Kasich is surging for two reasons. First, his operation recently spent significant funds in the state — $4 million on television advertisements, according to a spokeswoman for Kasich’s super PAC. During this time, only Christie's super PAC was on the air, spending $1.1 million on its advertisement buy, according to its spokesman. Kasich had another advantage: He enjoys being one of the newest candidates on the scene, having entered the presidential race on July 21, months after most of his competitors got in. He barely qualified for the prime-time debate last week on Fox News, which accepted only the top 10 candidates in national polls. Until his television campaign, Kasich was largely unknown — at least compared with the other candidates making regular visits to the state. But that lack of familiarity also means his position in the field could change as Republicans get to know him better. For example, conservative Republicans take issue with a few of Kasich’s decisions and statements as governor. He fought Ohio Republicans to expand Medicaid in the state as part of the Affordable Care Act. In Congress, Kasich voted for an assault weapons ban in 1994. He supports the Common Core educational standards and a path to legal status for illegal immigrants already in the country. “It’s like the little engine that keeps saying that it can,” he said after a Tuesday evening town hall meeting. 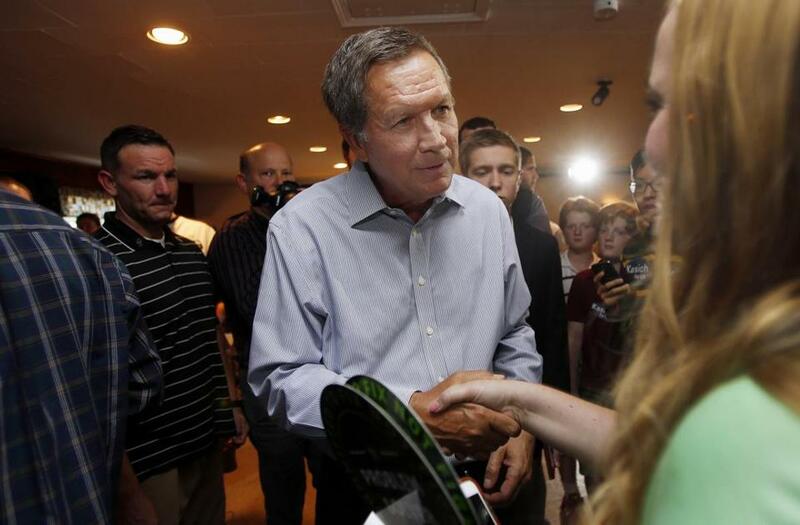 On the campaign trail, Kasich’s style is marked by his interaction with voters. He cracks jokes, often stopping mid-sentence to ask questions, employing the Socratic method like a law school classroom. Kasich begins his stump speech by recalling the time he was a college freshman and secured a 20-minute meeting with President Richard Nixon. He talks about Ohio, a must-win swing state for Republicans to recapture the White House. He regularly calls out new supporters in the crowd, and former US senator John E. Sununu of New Hampshire often introduces him. In the last week, he picked up high-profile endorsements from former state attorney general Tom Rath, New Hampshire House majority leader Jack Flanagan, and Belknap County Sheriff Craig Wiggin. Kasich’s success has come at the expense of some of the other 16 Republicans in the race. His eleventh-hour inclusion in the Fox News debate meant former Texas governor Rick Perry was bumped from the prime-time stage. The next day, Perry’s campaign notified its staff members that they would no longer be paid because fund-raising had dried up. In New Hampshire, Kasich’s climb has been especially detrimental to Christie. The most recent primary poll, from Franklin Pierce University and the Boston Herald, showed Christie falling back by 7 percentage points,while Kasich picked up 11 points from a March survey. “Since they are both governors of industrial states who have taken the same positions, Kasich is the alternative to Christie without the baggage,” Bass said. The same poll, taken Aug. 7 to 10, showed US Senator Bernie Sanders leading former Secretary of State Hillary Rodham Clinton by 44 percent to 37 percent among a sample of likely Democratic primary voters. The margin of error is 4.7 points. Also in surveys, Trump continues to dominate the GOP field in Iowa, home of the first nominating contest, in New Hampshire, and nationally. Though Kasich’s crowds this week have grown from the 50 to 150 people he had been drawing, they don’t match the 500 to 600 people who show up regularly to see Trump. At a town hall meeting Wednesday in Derry, Kasich said he was “truly touched” to see the crowd of about 250.